Dave has been telling me all along that he finds Shanghai very charming, but the general buzz one hears about China is so filled with stories of poverty, industrialization, poor ecology, and communism, that I had trouble hearing him. Downtown Shanghai is charming. Definitely the part of town we're staying in, the French Concession (the area was maintained by the French from the mid 19th century until 1946). Dave says it's the only part of the city to feature tree-lined streets. This morning, there were also a bunch of stands selling delicious dim sum -- buns filled with spinach, purple potato, brown rice. We were on our way to a brunch place Dave's pre-approved for us, but we couldn't pass these by. Dave took the afternoon off today, and we went to the World Expo. Dave's coworkers and my friend Yvette have been warning us that the Expo is crazy busy. The rumor had it that today was the last day the Expo is open to the general public; after today it's invitation only. Somebody said that the day before, on Saturday, there were 1,2 million people at the Expo, that it took them four hours to get into the US pavilion, that after spending a full day at the Expo, they'd only made it inside three pavilions. Yvette had advised me to go in the evening, when the crowds thin out a bit. But Dave wanted to go, and we had to fit the trip around his work schedule. It was drizzling lightly. Exiting the subway at one of the Expo stops, we were guided through metal detectors (we'd also had to go through a metal detector to enter the subway!) -- and emerged in a sea of people. All the country stands were divided by continent affiliation. Asia and Middle East to the right, Europe, Australasia, and the Americas to the left. We made the game plan on the spot: to skip all the big, popular pavilions, and go to the ones we can get into, the ones with short or fast-moving lines. We turned to the right, and went to Sri Lanka. Inside Sri Lanka, we found booths with blown up photographs of ancient ruins and Buddhist sites; ancient-looking vases and statuettes in glass cases; a few models of architectural structures and parks; food stand; a guy making silver anklets; lots of tea, scarves, saris, and jewelry for sale. This proved to be the pattern of the pavilions: photographs; glass cases with artifacts; some food items; stands selling souvenirs and parts of national costuming. Usually, in every pavilion we found one creative way a country distinguished itself from all the others. 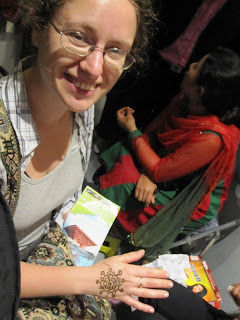 In the Sri Lankan pavilion, there was that guy making silver anklets. His work was quite intricate, and he had a full set of tools in front of him, from fine saws and files to pliers to other instruments I couldn't identify. If we didn't get pushed around by all others who wanted to take a peak at his work, we could've watched him for a good long while. 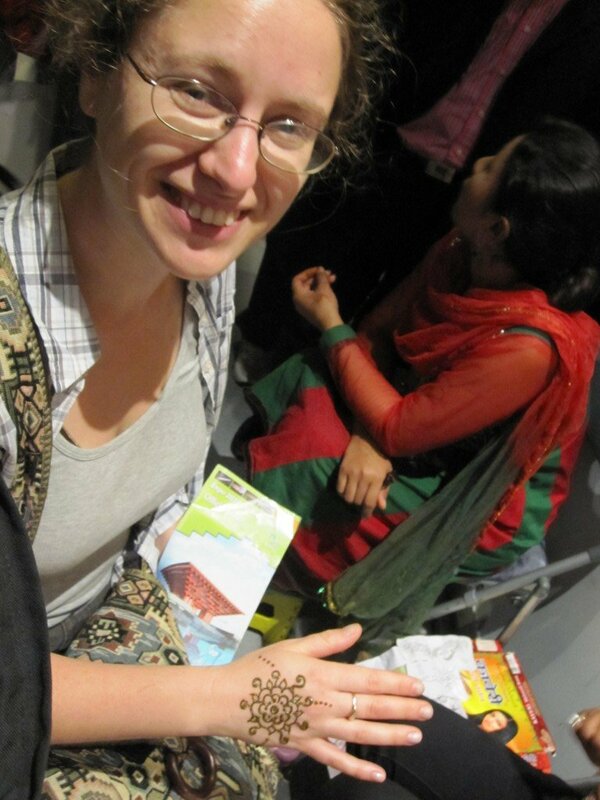 In the Afghanistan pavilion (they didn't have a full pavilion, but a space within Asia Pavilion 1), a woman from Nepal painted a henna drawing on my hand. In Uzbekistan, there was a map of the world with Uzbekistan at the center of the world, and "New York" occupying a third of the United States. In Viet Nam, there was the building itself, adorned inside and outside with bamboo in gothic church-like curves. Inside, there was also an oversized statue of Buddha and a zen pond with lotus flowers that might have looked very tranquil and zen, if not for the crowd that was stepping on our heels and rushing us along. In Nepal, there was another very beautiful building with intricate wood carvings for awnings and hand rails, but after we'd waited in line to get inside the pavilion, we found another line of people waiting for their turn to climb a ladder to the top of a two-storied globe, with indefinite rewards at the top. We opted out. The lines were intense. Dave and I stuck to our resolution to choose only the fast moving lines, but in these lines people kept moving fast right past us, as if we were completely invisible. To keep up with the crowd, we had to get aggressive, to work elbows and shoulders, to push forward or to push back, to hold our ground and inch forward. At the end of Nepal, we were completely exhausted. But we wanted to meet up with Dave's coworker Laura, and Laura's local friend. And we also wanted refreshments: we were thinking, Belgian beer, why not. To get to Belgium, we had to walk the length of the Expo, across all the continents, to Europe. We walked by a lot of long lines. The China pavilion had a long line. The Japan pavilion (that looked like a pig about to take off into space) had what we thought was a ridiculous line. The India and South Korea had people looping around and around in wait. But then we saw the line to Saudi Arabia that seemed to dwarf all the other lines. To get into Saudi Arabia, some people waited for six hours or more. Laura's friend told us that Saudi Arabia had the best attraction: a 3D movie right at the entrance. Do you have this beer? Let me check, ummm, I don't think so, no. They are dismantling the restaurant in the next few days or maybe weeks, so their supplies were dwindling. A receipt from the cafe got us inside Belgium pavilion -- and this is another good way to skip the crazy lines. Belgium boasted the Magritte museum, the solar plane that, judging by the movie, could lift itself 6 inches off the ground, the solar powered car for one skinny driver, and the chocolate samples that they'd just stopped giving out the minute we approached the stand. They also sold chocolate in another part of the booth, but that's not the same.